Many established companies will update their logo, whether it’s to appeal to a new demographic, or because your company is evolving. 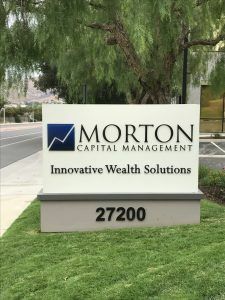 Morton Capital Management recently went through a logo update and we were contacted to update their interior and exterior signs for their Calabasas office. They are a major tenant in an office building so along with interior signs, they also had a building sign and a monument sign. Today we’ll be focusing on the new monument sign faces. From the photos, you can see that their new logo is much more modern and up to date. Orange Identity is the digital marketing company that assisted them with the logo change, and they were the ones who had found us online to take care of the new signs. The new sign faces we made for their monument sign are push-thru acrylic letters on an aluminum panel. Push-thru letters are just translucent or clear acrylic letters that are backlit so the letters light up. You can leave the acrylic bare, or put vinyl on the faces so the letters are edge-lit. 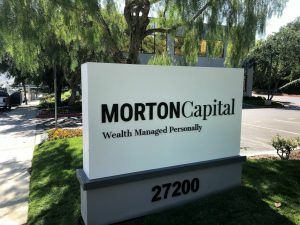 This is what we did for Morton Capital’s monument sign letters. 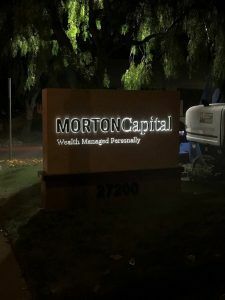 We went with this style because the client wanted the monument sign letters to match the dark gray channel letters that were going to be made for the building, and they wanted the letters to be visible at nighttime. Having edge-lit letters instead of letters that are completely illuminated creates a classy look, and works great with the typeface used in their logo. Even if your business is not open at nighttime, having a lighted sign at nighttime helps create brand recognition, and will definitely help your business stand out if you have a large lighted sign near the street. You never know who may be driving by at nighttime that could be interested in your business services so it’s a smart idea to advertise 24/7. Do you have an existing monument sign that you want to update? Whether you need to display a new logo or if you just want to refurbish the existing style, we can handle the job. Give us a call today to get started on your monument sign update.